Back in September, we wrote about the Ford Power of Choice tour. At their stop in Michigan, students got in trouble for touching the Ford Focus Electric, and found out that it was an internal combustion Ford Focus with an electric charge port Velcro-ed on! A little over a month later, Ford returned Grand Valley State University with the real deal – a drivable, working model of the 2012 Ford Focus Electric. The working model of the Ford Focus Electric was on display for a couple of hours evening for students to check out up close. The Ford team was on hand to answer questions, and Dan Pierce (left) was there to talk about the Ford Focus Electric. While there were no test drives, a Press reported did get a short, smooth ride around the parking lot to show off the quietness of the Ford Focus Electric that Ford expects to launch into production by the end of this year in some North American markets. 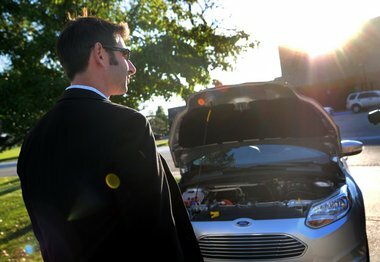 After the first Power of Choice stop, blog posts criticizing the event made it’s way to Ford via Twitter – that’s when Ford decided to send Daniel Pierce and Mike Tinskey back with the real Ford Focus Electric. The even was somewhere between a press conference and a guest lecture in public relations. At the event Ford was still keeping a tight lid on the 2012 Ford Focus Electric’s official launch date and price, but Pierce promised they would come very soon.